One question I’m commonly asked, “How does the fishing on an afternoon charter compare with a morning charter. My answer…, it all depends on the time of year and the weather and lake conditions. 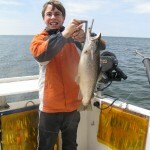 Recent trips on the afternoon of April 22 and the morning of April 23 are a good example. The weather on April 22 was warm and sunny all day with a steady, gentle southerly wind. With the Oswego River flow at 21,600 cfs and the water very turbid, the plume from the river had reduced the water clarity in the area of Lake Ontario east of Oswego Harbor to less than 3 feet. Because of the turbidity, on the morning of April 22, the browns weren’t active until the rays of the sun hit the water, typical brown trout behavior in early spring when water temperature is cold, on 4/22, 47 degrees. The brown trout bite was good all morning. Just before 1:00 PM, when Mike and his son Tucker stepped onto dock #21, at Oswego Marina, where my charter boat, the “Fish Doctor” is moored, they didn’t have to ask. After having to reschedule their trip from morning to afternoon because of a scheduling conflict, they were wondering if the afternoon fishing was going to be as good as the morning trip. Thirty minutes later, we boated our fifth brown trout, and Tucker was absolutely awed and elated. By the end of the trip after lots of action, 8 browns and 1 coho added considerable weight to the fish cooler. Perfect weather and water conditions, plus pinpointed location, and an effective lure-of-the-day formula had produced a great fishing trip. The following morning, 4/23, was cold with heavy rain and a howling south wind gusting to over 30 mph, scattering warm shorline water, bait, browns and cohos all over Lake Ontario. Morning fishing was tough with browns reluctant to open their mouths and just 4 browns and 2 cohos in the “box”, and almost nothing in their stomachs when I cleaned and packaged the fish. Just before noon as we were pulling lines after a 6-hour trip, the sun broke thru the clouds, the wind subsided, you could feel the warmth, and gulls that had been roosting, immobile, on the breakwalls all morning, took to the air. A color line, was starting to develop outside the harbor. I didn’t have an afternoon charter, but I would have bet my crew my favorite Fish Doctor ShortStick that the afternoon fishing would have been excellent as browns and cohos that had been “hibernating” all morning started actively feeding. With the air temperature in the mid30′s and the weather forecast predicting rain and southeast winds gusting to 50 mph, it was hard to say what the fishing out of Oswego Marina was going to be like when my charter of Clarkson graduates and I headed out in the Fish Doctor at 6:00 AM on Sat., April 16, 2011. Conditions weren’t great, but with the surface water temperature in Oswego Harbor 49-50 degrees and the water quite turbid, the brown trout didn’t seem to mind the weather. For the next 6 hours action was steady, with 11 browns, 2 cohos, and one rainbow trout coming to the net. Black and silver F-11 Rapalas and Smithwicks in blue/silver/orange and blue silver were the hottest stickbaits, with a hammered silver/blue Wolverine MiniStreak taking most of the fish on the riggers. Heavy wind gusts made it tough to control trolling speed, but most of the fish came from about 1.9 to 2.6 mph. In these conditions, I like to run a variety of tuned Smithwicks so that I know that I’ve got a Stickbait in the water with the proper action no matter what the speed. Because of the weather, there was only one other boat on the water on Sat. morning. 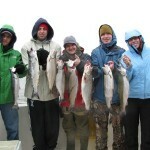 Part of a 4/16/11 catch 14 of brown trout, coho salmon, and rainbows.